The derivation of the name of the Parish, 'Taney' suggests that it comes from the Irish 'Teach Nahi' or 'Nahi's house' although, another likely source is 'Tamhnach', meaning 'a green field, an arable spot. There seems little doubt that religious worship was taking place here for some considerable time prior to the Anglo Norman conquest of 1172. By the mid 12th Century it is known to have been a Rural See, which subsequently became the rural Deanery of Taney. After the conquest Taney Church and its surrounding lands were assigned to the See of Dublin and shortly afterwards Taney became a prebend of St Patrick's Cathedral. The earliest original records, deposited in the Library of the Representative Church Body, date back to 1791 and are useful for determining the size of the parish at that time. As the parish grew in numbers, the old church was proving too small, and as early as 1809 discussions had begun on replacing the parish church by a new and more spacious structure. Christ Church, Taney was completed and opened for worship in 1818, though not fully consecrated until 1872. In 1859, services were begun in a room in Mount Merrion, and the parish's third church, St Thomas', was built there in 1874. It became a separate parish in 1956, finally amalgamating with Booterstown in the 1990's. In 1867, a licence was granted for the performance of Divine Service at what was then known as the 'Dundrum Lunatic Asylum' and Church of Ireland services are held regularly at the Central Mental Hospital to this day. By the turn of the 20th Century Taney Parish comprised of the following townlands: Balally, Ballinteer, Churchtown Lower, Churchtown Upper, Drummartin, Dundrum, Farranboley, Friarsland, Kingstown, Mount Anville, Mountmerrion or Callary, Mountmerrion South, Rathmines Great, Rathmines Little, Roebuck, Ticknock and Trimlestown or Owenstown. At the beginning of the new Millennium, the parish as it now stands is bounded by Milltown to the north, Ticknock to the south, Churchtown to the west and Goatstown to the East. With over 800 families and 2000+ parishioners, Taney is now the largest numerical Church of Ireland parish in the Republic. From a rich diversity of backgrounds and traditions its families and people blend into a lively and vibrant community in which everyone has a vital role to play. The present St Nahi's Church was erected in the middle of the 18th Century as a result of the efforts of the then Arch-deacon of Dublin, Dr Isaac Mann and his Curate Revd Jeremy Walsh. It was consecrated on 8th June 1760 by Richard Robinson, Bishop of Ferns and Leighlin who later became Primate and it had the distinction of being used the following year by the Bishop of Limerick for the ordination of Priests. It was designed as a simple rectangular box shape and nowadays we tend to regard its simplicity as part of its attraction and charm. The beautiful needlework pictures behind the Holy Table are the work of the Misses Yeats, sisters of poet W.B.Yeats. The font and the window in the Baptistry are both of interest. The Font, which was moved from St Kevin's Church, is the one in which Arthur Wellesley, later to become the Duke of Wellington, was baptized on April 30th 1769. 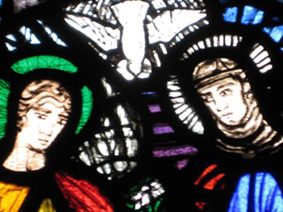 The window - the central panel of which portrays the Annunciation - is by Evie Hone. 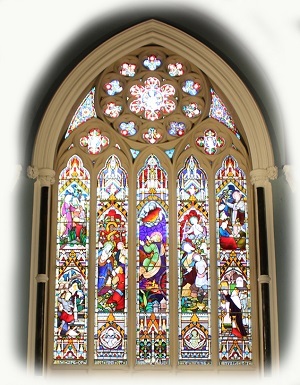 The window was completed in 1926 but it was not until 1933 that it was placed in its present position in St Nahi's. As the building became too small for the accommodation of all the parishioners it was decided at a vestry meeting in June 1809 to build a new Church on a convenient site near the present church. 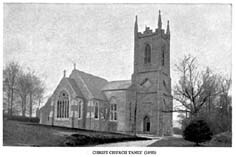 Christ Church, Taney was opened in June 1818. It appears that the old church was closed for public worship for much of the remainder of the Century. In the 20th Century the 'old church' of St Nahi's enjoyed a revival and is now very much at the heart of the worshipping community in the 21st Century. Following concerns about overcrowding, the select vestry unanimously resolved that from Sunday 19th April 1964, the 10.15am service at that time held in St Nahi's be held in Christ Church and the 11.30am service then held in Christ Church be transferred to St Nahi's. The latter is now held at 11.45am and is well supported by adults preferring a quiet service. The old churchyard, in the midst of which St Nahi's Church is sited, features prominently in the earliest documentation available in the Parish. It covers an extensive area and contains over 1200 graves of which we have the names of those buried in over 800. An index is held by the Parish Office. Further details can be found in Ball, Elrington Francis and Hamilton, Everard "The Parish of Taney: A History of Dundrum, near Dublin, and its Neighbourhood" publ. Hodges Figgis & Co Ltd 1895. Available from R.C.B. Library. The Churchyard precedes the disestablishment of the Church of Ireland and thus is open for burial to all those who live within the boundaries of the Parish of Taney, whatever their denomination. Whilst there are very few graves still available for burial, the addition of a Garden of Remembrance in the 1990s for the burial of ashes has been a very beneficial facility for the community. The churchyard is very well cared for by our parishioners and provides an oasis of quietness in the middle this busy Dublin suburb. We now know, with the discovery of a Rathdown Slab in St. Nahi's Graveyard, that Vikings settled in Dundrum, and that at least 1000 years ago Christians were buried at St. Nahi's, confirming that the hill on which the church stands was indeed an ancient ecclesiastical centre. The first such stone was discovered in March 2002 by Mr. Chris Corlett, an archaeologist with Duchas, when he missed his bus in Dundrum and decided to visit St. Nahi's Graveyard as he had time to spare. He noticed a piece of stone that stood approximately 30cms above the ground. The top part was missing and was found in March 2003. This Rathdown Slab is made from a piece of reddish granite that, according to Chris Corlett, sometimes occurs in the locality. It features a cupmark and a saltire cross that is formed by elongated X-shaped lines. An incised line runs down the centre of the slab. Rathdown Slabs are so named because they are unique to the Barony of Rathdown. They feature a distinctive type of decoration not found elsewhere in Christian Ireland. 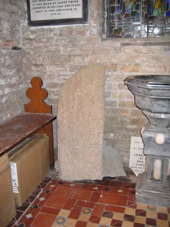 One third of a second Rathdown Slab was discovered on 1st January 2004.